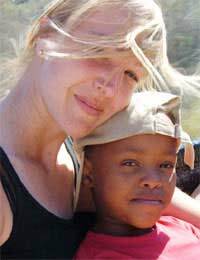 Tracy, who's from Winchester in Hants, found a programme where volunteers work on a game reserve in South Africa, something she had always dreamt of doing. So she rented out her flat, bought herself a ticket and flew out to the African hinterland. She was gone four months. Tracy hopes that her company will help fulfill a gap where others have failed. “On my career break I met so many people in my situation and my age who had given up their jobs and had to rent out their property. They were all fearful what on earth they would do when they got home. Nobody offered a support service for people out there who encountered problems along the way, such as the structure of the programme, if two sets of volunteers perhaps were not getting along, or if somebody found out the programme was different than what they expected. Her company offers people full-time support when they are away, as well as help finding jobs, including writing CVs and preparing for interviews, when they return back to the UK. It also helps them “cope with post-holiday blues which we all experience when we get back,” Tracy says. The hope, she says, is that people will not find themselves in the situation she was, coming back to no job, no place to live, and no idea about where to go next. But despite that, she says the experience was the fulfillment of a lifelong dream – and one she'll never regret. She recommends that anyone contemplating a break also choose to do something meaningful, not just take time off for navel-gazing or hanging out. “The only career break I would ever suggest is one where you can get something out of it, such as learning a new skill, volunteering, helping the planet or a child, something that either enhances your skills or helps you to become a better person.